Following the adoption of the revised UN Standard Minimum Rules for the Treatment of Prisoners – the Nelson Mandela Rules in December, consultations are being held around the world to raise awareness and to seek the views of national policy-makers and prison authorities on implementation. PRI has hosted consultations in Uganda and in India. 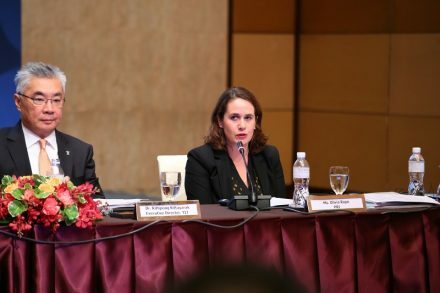 Last week, it was the turn of 11 South East Asian countries who gathered at a meeting in Bangkok hosted jointly by the Thailand Institute of Justice and PRI. Here, PRI Programme Officer, Olivia Rope, reports on what will be a big concern for many prison systems: lack of resources. ‘We need to think about not only prisoners’ time during their imprisonment but also about their social integration needs: their life post-release’, explained Thailand’s Minister of Justice, General Paiboon, at a consultation meeting last week in Bangkok on the Nelson Mandela Rules (revised UN Standard Minimum Rules for the Treatment of Prisoners). The revised Rules set out what should be in place to ensure that prisoners’ life post-release is a law-abiding and self-sufficient one. Prison authorities from South East Asia gathered to discuss areas of the Rules that were revised, covering current practices, challenges and questions regarding implementation. The consultation was co-hosted by the Thailand Institute of Justice and Penal Reform International. 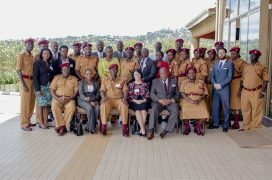 The discussion benefited from the wide range of countries represented with 11 prison systems and various organisations, including the International Committee for the Red Cross (ICRC) and the Raoul Wallenberg Institute in the room. While practices vary across the region and in some cases views diverged on the modalities or feasibility of implementing the revised Rules, a key challenge shared by all is the inadequate budgets available to prisons. However, while the question of resources is significant for many of the revised Rules, it is not for all. With the right governance, training and a culture of respect for human rights, many of the Rules can be put into practice without significant cost. The other point that was rightly made is that the resources that are available will go further if money is invested in the right places and directed to where it is needed most. Two of these key areas are classification and prison staff. With proper categorisation and classification of all prisoners, individual assessments determine the level of risk that a prisoner may pose to staff, other prisoners and themselves. It also exposes any specific needs and vulnerabilities. In the absence of effective classification, we often see ‘over-classification’ where prisoners are housed in higher security facilities than necessary. This has an impact on a prisoner’s contact with their families, participation in a wider range of rehabilitation programmes, and often other basic things, such as amount of time spent outside of his or her cell. From a prison management perspective, participants explained, that the use of restraints, searches (cell and body searches) were employed more in higher security facilities. Where there are low staff-prisoner ratios, dynamic security  is more difficult to apply. All of this costs more money and places greater demand on prison staff. With proper classification, prisoners with disabilities can be accommodated for on an equitable basis, vulnerable groups can be protected, and staff and prisoners can be protected from those who do actually pose a higher risk. In the longer term, individualisation and appropriate treatment that takes account of people’s specific needs results in improved rehabilitation of prisoners and less recidivism. Investment in prison staff was another area highlighted as critical, particularly when resources are limited. While having a team of prison staff that is well equipped and professional will go a long way towards implementation of the Mandela Rules, the reality is that ‘most are doing their job with minimum knowledge and skill’, as one delegate put it. Investment needs to made in prison staff as the backbone of a prison facility: this includes not just training but also to ensure their working conditions are safe and favourable in view of the demanding nature of the work. Dr Kittipong, the Executive Director of the Thailand Institute of Justice, rightly said that last week’s consultation should serve as ‘a venue to seek a common understanding on how the Mandela Rules are to be understood’. While the consultation threw up many challenges for implementation, one delegate’s comment gives reason for optimism: that with the right attitude and approach ‘pragmatic and lateral solutions’ can be found. For more on dynamic security, see PRI, Balancing security and dignity in prisons, 2013. Photo: Dr Kittipong, Thailand Institute of Justice & Olivia Rope, PRI Programme Officer.